Around one in ten people in the UK have a problem with their jaw joint. Doctors call this group of conditions jaw joint dysfunction or temporomandibular disorder (TMD). They can cause pain and affect how well your jaw joint works. Women tend to develop these jaw conditions more often than men. You can get these problems with your jaw at any age, but most people have them when they’re between 20 and 40. The medical name for your lower jaw is the mandible and the joint is called the temporomandibular joint. So these jaw joint problems are also called temporomandibular disorders (TMD). You might also hear them called myofascial pain disorder. Overall, around one in ten people develop jaw joint problems at some point in their lives, but it may be as many as one in six women. Up to seven out of ten people have one of the symptoms at some point. 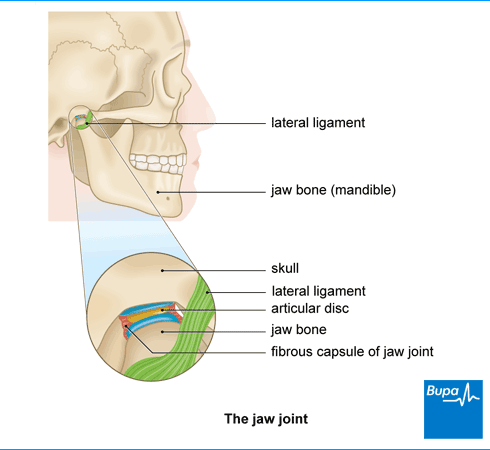 The jaw joint allows your jaw bone to move from side to side, backwards and forwards, and to open and close your mouth. It’s one of the most complicated joints in your body and has several muscles and ligaments allowing different movements. Because it’s so complicated, there are several different problems you may have with your jaw joint. Not everyone has pain when they have jaw joint problems. Some people just have clicking and difficulty opening their mouth. If you do have pain, you may find that it gets worse as the day goes on. Symptoms may also get worse when you chew, or if you’re feeling stressed. You may be able to manage these symptoms at home and they often get better on their own within a few months. But if you’re worried about the pain or other symptoms, go and see your dentist to find out whether treatment could help. If you have discomfort or problems with your jaw, see your dentist. They will ask about your symptoms, examine you and ask about your medical history. They will then examine your head, neck, face and jaw to see if you have any tenderness. They may ask you to move your jaw in all directions too. This can help them to see how well you can move your jaw, and whether it’s painful or makes clicking noises when you move it. They will also want to look inside your mouth to see if you have any problems with your teeth or gums. Your dentist will also ask you whether anything triggers your jaw problems, such as chewing or yawning. They will also check whether you grind your teeth or bite your nails, as both of these can cause jaw problems. Because the jaw joint is so complicated, there are lots of possible causes of jaw problems. Therefore, it can be difficult to work out what’s causing your symptoms. The diagnosis is usually made after examining you and asking about your symptoms. Tests don’t usually help, but they can be useful in some cases; for example, to see if part of your jaw joint is out of place or whether arthritis is causing your problems. Your dentist might refer you to see a specialist doctor, such as an oral and maxillofacial surgeon. Jaw joint problems will often get better within three to six months and don’t usually cause any complications. Resting your jaw joint may help to relieve your symptoms. Here are some tips. Eat soft foods so you don’t have to chew food for too long. Don’t yawn widely, chew gum, chew pens or pencils, or bite your nails. Try to stop any habits such as clenching your jaw or grinding your teeth. Try to reduce stress if you can, as this can make jaw clenching or teeth grinding worse. You might find relaxation techniques helpful. Massage the muscles around your jaw. Put a heat pad or a hot water bottle (filled with warm, not boiling, water) wrapped in a cloth or towel on your jaw. If you do need treatment, the type of treatment you have will depend on the exact cause of your jaw joint problem. See our section on causes of joint problems for more information. You may find that over-the-counter painkillers, such as paracetamol or ibuprofen, help to ease your pain. There are some other medicines your dentist might suggest if you’re in a lot of pain. See our FAQ: ‘Which medicines can help with jaw joint problems?’ for more information. If your dentist thinks you’re clenching your jaw or grinding your teeth when you’re asleep, they may suggest you wear a bite guard (bite splint). This is a plastic cover that fits over your upper or lower teeth and stops them coming into contact with each other. There isn’t any conclusive evidence about how well bite guards work, but people often find that they can reduce pain. There’s some evidence that physiotherapy may help to improve symptoms for some people. Some research has suggested that exercises and massage may help to treat jaw joint problems. We need more research before we will know for sure though. Self-help measures, medicines and non-surgical treatments will probably ease your discomfort and relieve your symptoms. Most jaw joint problems don’t last long and won’t get worse. But if your condition doesn’t start to improve within three months, your dentist may refer you to see a specialist. This could be an oral and maxillofacial surgeon or an ear, nose and throat specialist. Your specialist may suggest surgery if you have severe pain and your jaw joint is causing you significant problems. Only a small number of people have surgery. Usually, you’ll only be offered this if you’ve tried other treatments and they haven’t worked. In some cases, your surgeon may try and manipulate your jaw joint while you’re under general anaesthetic to see if they can correct the problem. Or they may suggest an injection to relax the muscles that control your jaw. Operations to treat jaw joint problems can involve opening your jaw joint and operating on the bones, cartilages and ligaments. Another option is to replace your jaw joint with an artificial (prosthetic) one. It’s important to discuss the risks and benefits of surgery with your surgeon to see if it’s the right option for you. Some people try acupuncture to help relieve the symptoms of jaw joint problems. This may be useful in relieving jaw joint pain for a short time. However, we need more evidence from trials before experts can say for certain that it’s effective. The exact cause of jaw joint problems isn’t always fully understood and there are a number of possible causes. Many people have more than one cause at the same time. They may be triggered if you injure your jaw during more complex dental treatment (such as having your wisdom teeth removed), knock your chin or overstretch when yawning. Clenching your jaw or grinding your teeth (bruxism) may cause jaw joint problems. But lots of people with jaw joint problems don’t grind their teeth, and many people who do grind their teeth don’t have jaw joint problems. Disc displacement means that the articular disc is in the wrong position. This is a thin disc inside your jaw joint. This can happen if you dislocate or injure your jaw. You might hear noises when you move your jaw, such as clicking, grating or popping. Osteoarthritis is more common in your knees, hips and hands but it can affect your jaw joint too and wear it down. See our FAQ on arthritis and jaw joint problems for more information. Which medicines can help with jaw joint problems? Which medicines can help with jaw joint problems? Painkillers that you can buy over the counter, such as paracetamol or non-steroidal anti-inflammatory drugs (NSAIDs) – ie, ibuprofen, may help to relieve the pain of a jaw joint problem. If you're in a lot of pain, your dentist may prescribe you a muscle-relaxing medicine to help reduce the tightness and pain in your jaw. They may suggest a drug called diazepam, for example, which relaxes your muscles and can relieve spasms in the jaw. It can also reduce anxiety, which can be helpful if stress is causing you to grind or clench your teeth. Your dentist will only prescribe this for about 10 days. This is because it can be addictive if you take it for longer periods. Medicines to help treat depression, known as antidepressants, can also be helpful to relieve pain particularly nerve pain. You might need to see your GP to get a prescription for some of these. So that you don’t have side-effects, your doctor or dentist will prescribe the lowest possible dose that treats your pain. Can jaw joint problems be caused by arthritis in my jaw? Can jaw joint problems be caused by arthritis in my jaw? Sometimes jaw joint problems are caused by arthritis in your jaw joints but this is not common. It usually only happens in elderly people and jaw joint problems usually affect people between the ages of 20 and 40. Arthritis causes inflammation (swelling) of your joints. There are different types of arthritis, including osteoarthritis and rheumatoid arthritis. Both of these can affect your jaw joint, as can arthritis caused by an injury or infection. Sometimes, injury to your jaw can cause secondary degenerative arthritis in younger people. Secondary degenerative arthritis means your arthritis is a result of another condition. This can also happen if you have had jaw joint pain for a long time. Your dentist may refer you for an X-ray to diagnose if you have arthritis in your jaw. Treatment is generally the same as for jaw joint problems.